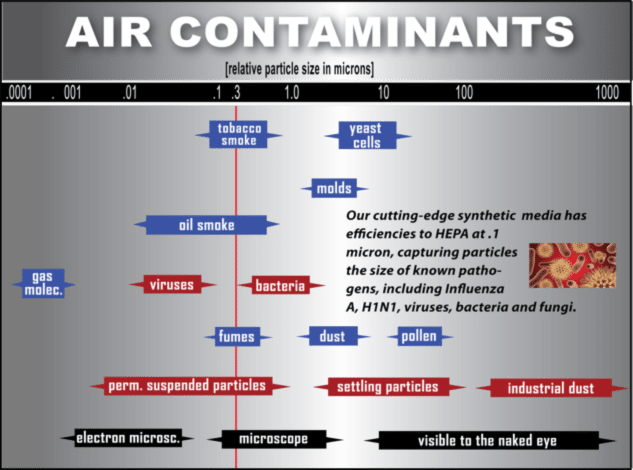 Pathogens have been shown to spread through the air over long distances, even through the HVAC system. This recently discovered transmission route is explained and clearly documented in the ASHRAE Position Paper, “Indoor Infectious Disease”, 2009. This groundbreaking document provides the latest studies, and names specific disease like Influenza that have been proven to be spread via this airborne route. Contributing to this problem, submicron particles have little to no weight and therefore nominal gravitational pull. They move on the wind, acting more like a gas than a particle, and remaining suspended almost indefinitely. HVAC filters currently used in most systems were designed to protect the coil from dirt rather than to filter submicron pathogens from the air. Submicron, permanently suspended particles, are pulled into the HVAC system through the return vents, mixed at the coil and redistributed to all rooms. Through this process diseases are spread. The Sanders Containment Filter was designed to filter submicron particles as they enter the HVAC system. After installing these filters over all return vents, the submicron particles are trapped and held in the media to prevent the mixing and redistributing of particles the size of known pathogens to other rooms. The design provides high efficiency media upstream of the existing holding frames that completely seals, with no bypass, thereby eliminating the need to retrofit the old frames that that do not completely seal. The total protection system can be configured for various levels to capture submicron particles and gases. The gasket duct frame system eliminates filter bypass, thus ensuring that the filters operate at rated capacity. Never before in the history of air filtration has it been possible to filter at the sub-micron level without making extensive changes to HVAC systems. The Sanders Containment Filter provides for affordable, low-cost and high-end filtration for hospitals, nursing homes, assisted living facilities, pharmacies, clean rooms, schools, business and homes. Anywhere people live, work and play submicron filtration should be used.